No one who loves their pet wants it to die. Aquarium fish are no exception. Goldfish, one of the most popular pet fish, often die before their time. In fact, goldfish live longer than most people expect them to when placed in the proper environment. If your goldfish is dying, it may not be too late to save it with the right equipment. Goldfish ofter get sick because of the water they live in. Everything a goldfish eats moves through its digestive tract in about five minutes. Despite popular belief, goldfish should live in more than 5 gallons of water because of the large amount of waste they produce. Water should be partially changed every few days and products to restore electrolytes to the water should be added weekly. Goldfish owners often add detoxifying solutions to the water every time water is changed completely to stabilize the water. Fixing problems with water helps sick fish recover. Lots of goldfish owners shorten the life of their pet by keeping it in a fish bowl. Fish bowls stunt the fish's growth and cause quick buildup of pollutants in the water. Smaller volumes of water change temperature faster and cause sharp temperature changes in the fish's environment. Ideally, a goldfish should live in an tank with at least 20 gallons of water to prevent pollutants from building up quickly. The fish can grow larger and have a cleaner, more stable environment in which to live. Aquarium filters help maintain a healthier environment for goldfish. Placing a filtration system in your tank decreases pollutants, adds vital oxygen to the water, and prevents the buildup of toxins that kill goldfish. Filter cartridges should be replaced when recommended by the manufacturer; more frequently if they become too dirty sooner. 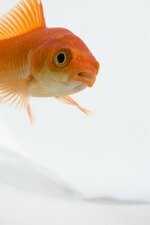 Goldfish with filtered water don't have to rise to the top of the tank to find oxygen, so the chance of swimming bladder disease (the disease that makes live fish float) decreases. Does your goldfish have small white spots growing on their bodies? The spots are the result of Ick. Microorganisms live in fish tanks and bowls all the time and grow on the sides of fish that have been stressed or have fallen ill. Fish supply stores sell solutions to fight Ick when it grows on fish. No sure cure exists for swim bladder disease. Koko's Goldfish recommends not feeding for three days and then feeding presoaked peas exclusively for the next three days.